It’s not always pretty, but the Columbus Blue Jackets keep finding ways to climb up the standings. Their latest efforts have propelled them to within just two points of the lead in both the Metropolitan Division and the NHL. They say good teams find ways to win when they’re not playing their best. The Blue Jackets won three of their last four games despite noticeable lapses in their game. Perhaps the Blue Jackets are a good team after all. That’s because they are a good team, even though all the talk centers around the Capitals, Penguins, Blackhawks, Wild and Sharks. A win Saturday will put the Blue Jackets in a tie for the league’s top spot. Bad teams do not live at the top of the standings. But they realize there’s work left to do. 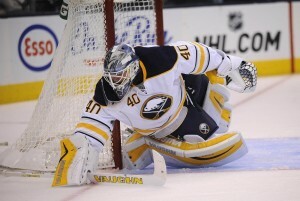 Let’s flashback to the two games against the Buffalo Sabres. Goaltender Sergei Bobrovsky came into that first game with a long shutout streak. Momentum seemed to favor the Blue Jackets against a lesser opponent. But just 2:50 into the game, Columbus was down 1-0. Their failure to clear the puck set the goal up. This was not a good start. To their credit, they tied the game less than four minutes later. A well-timed faceoff win helped the Blue Jackets get on the board. Brandon Dubinsky won the puck back to David Savard, who let what looked like a harmless shot go. Robin Lehner appeared to never see the shot. The puck went over Lehner’s shoulder and it was a new game. The Blue Jackets then used their power play to take the lead. Nick Foligno redirected an Alexander Wennberg pass to make it 2-1. It wasn’t very pretty, but the Blue Jackets had a lead. It didn’t last long however. Less than five minutes into the second period, Josh Gorges was the lucky recipient of a puck that once again, the Blue Jackets couldn’t clear. Jack Eichel fed Gorges, who blasted a long one past Bobrovsky. Even strength play favored the Sabres throughout. So leave it to the Blue Jackets power-play to regain the lead. Sam Gagner was left alone and he blasted a shot past Lehner to make it 3-2 Blue Jackets. Maybe now the Blue Jackets would put this game away. Rasmus Ristolainen had other ideas. He received the puck on the right point and shot it toward the net. The puck hit Bobrovsky and bounced behind him into the net. This game was not one of Bobrovsky’s better performances in an otherwise outstanding season. With 14 minutes left, the game was tied at three. But as the Blue Jackets have demonstrated most of the season, they found a way to win this game. This time, Boone Jenner made an outstanding play to create the game-winning goal. Cam Atkinson beat Gorges to a loose puck and fed Jenner. Jenner waited out Lehner and put the winner in. The Blue Jackets got their two points thanks to a 4-3 win. But they were saved by their power play converting twice. The next night in Buffalo, it appeared the Blue Jackets had the game wrapped up after the first period. Columbus scored three times in 11 minutes to open up a 3-0 lead. The Sabres then scored five unanswered to split the two-game series. Jake McCabe scored just 18 seconds into the second period. After Matt Moulson made it 3-2, Sam Reinhart scored with under three seconds left in the period to tie the game. The air was out of the Blue Jackets sails on this night. Still, they needed to win the third period to get another two points. Not this time. Thanks to undisciplined play, the Blue Jackets took a late penalty with the game tied at three. Evander Kane converted the game winner late on that power play. Despite their best efforts at the end and great goaltending by Lehner, the Blue Jackets could not tie the score. Their no-show in the last two periods cost them. Now it was off to Philadelphia for a Monday night showdown with the Flyers. The Blue Jackets arrived in Philadelphia and managed to pack their undisciplined play with them. It turned an early 2-0 lead into a 3-2 deficit. Travis Konecny scored twice while Brayden Schenn added a power-play goal. Instead of folding like a dollar bill, the Blue Jackets found a way again to rescue this one. As the second period wound down, the Blue Jackets won a faceoff in the Flyers zone. Zach Werenski shot the puck from right point and beat Steve Mason to tie the game. Even though this effort was far from their best, the Blue Jackets just needed to win the third to gain two points. Unlike Buffalo, they succeeded in their mission. After a sluggish start that saw the Blue Jackets successfully challenge a potential Panthers’ goal, the Blue Jackets took advantage of some limited opportunities and gained a 2-1 lead. After Jonathan Marchessault opened the scoring, Werenski from the near wall saw an opportunity and fired the puck on net. It beat James Reimer to tie the score. You normally don’t score from that spot. The Blue Jackets took advantage of the break. Then they broke the Panthers’ backs by taking the lead with under 40 seconds left in the second. Jack Johnson was wide open at center point and blasted the puck. It hits Anderson and beats Reimer. Again, these are not the prettiest goals you’ll ever see, but they count all the same. Bobrovsky locked it down to secure the two points. Thanks to good goaltending, penalty killing and defense, the Blue Jackets made two goals stand up. As Tortorella noted earlier, the Blue Jackets found a way. That’s what matters to this team. It’s not always pretty. You’ll likely scream at your TV at times. But at the end of the day, the Blue Jackets secured six of a possible eight points in their last four games. A win is a win. They’ll take the wins and the points while knowing they have plenty of work left to do. For these Blue Jackets, it’s not about style. It’s about finding a way. This past week, the Blue Jackets found a way, even if they didn’t deserve it. That’s a sign of a good team. In the playoffs, it’s all about finding a way to win. The Blue Jackets are off to a good start in that regard.